The Alligator Bayou guest room refurbishment program is continuing apace, with one new building commencing work every Sunday. Building #39 closed today, and building #34 is due to close on Sunday 17th June. The work is generally taking twelve days per 64-room building, so #39 and #34 are intended to be returned for guest use on the 22nd and 29th of June respectively. As previously mentioned, the ‘twenties’ numbered buildings are taking slightly longer to complete due to the additional roofing work that is being carried out, which is being further hindered by the wet Florida summer weather. Buildings #27 and #25 are currently estimated to be returned for use on the 20th and 27th of June, but those dates are still somewhat uncertain. Finally, buildings #26 and #35 will both be closed together on Sunday 24th June, which will signal the final goodbye for the last few non-refurbished guest rooms at Port Orleans. By the end of the first week in July there should be just one building still undergoing renovation (#26) which will hopefully be completed around the third week in July. For the latest updates, please keep an eye on www.portorleans.org/rehab.php. The work on the main lobby at Port Orleans Riverside is also moving along well now, with the new chandelier already hoisted up into place. Work continues on laying the fabulous new tiling, and currently the plan is for the construction walls to be removed overnight on Wednesday 20th June, reopening for guests on 21st June. Update on 20 June: The lobby reopening has been slightly delayed until around Monday 25 June due to extra work being done on the new floor tiles (and drying time). If you are planning on getting your tickets in advance it might be best to do it on Saturday, as most ticket types don't start to expire until you actually commence using them. Buildings 15 and 28 will be re-opening on Friday 25 May as planned. Next to commence work will be building 25 (instead of 18 as originally planned) which should be ready for re-opening on 8 June (or shortly after). Building 18 will now be started on 3 June, due for completion on 15 June. Building 39 will be started on 10 June and finished on 22 June. As always, please see the Refurbishments Page for the latest updates. 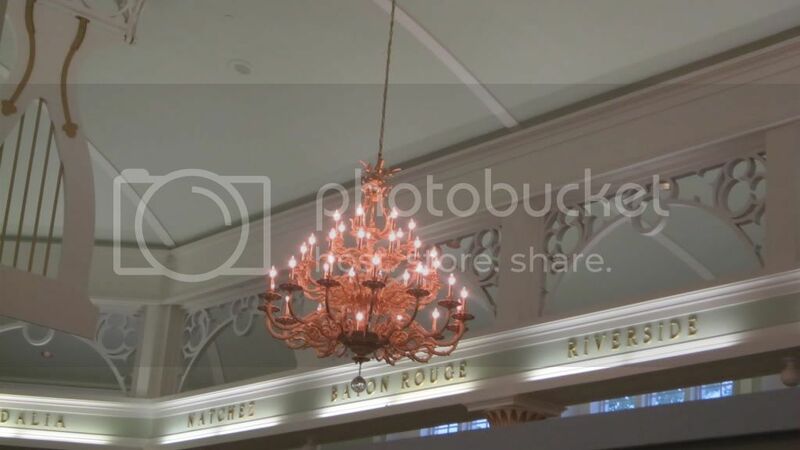 The first stage of the Port Orleans Riverside Lobby Refurbishment has now been unveiled and we have a few photos to share. 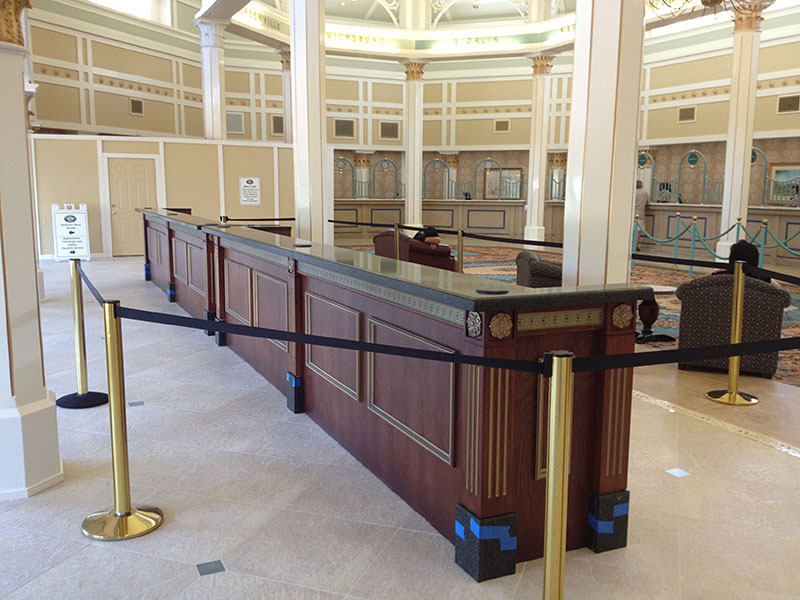 Work will continue on the other side of the lobby very soon, and during that phase checkin facilities will be at the new desks while concierge services will be operating from in front of the River Roost Lounge. The likely completion date is now looking to be around 22 June according to Bob Jackson's revised schedule. I can't wait to see this finished - given the level of detail we can see so far, and the quality of the finish, I think it will look really beautiful. 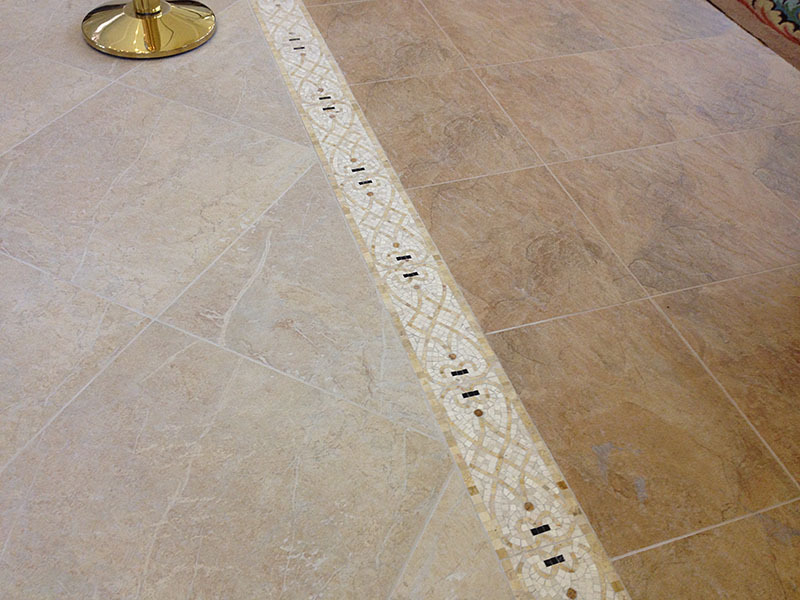 The more I look at this photo the more I think that all of the above tiling is new. I'm sure the older tiles were lighter and more neutral in colour, and the grouting was darker. I was going by what I was told by the photographer about the right-hand side being old, but those darker tiles look far too new and match so perfectly with that gorgeous decorative strip that I think they must all be new. Also the original hard-wood border between the tiles and the old carpet is gone. All of the tiles in the above photo are definitely the new style. The remaining two-thirds of the lobby has now been walled off, and construction work there has commenced (mostly overnight after 11pm). Registration/checkin is now being handled from the new desks, which are currently facing outward beside the corridor to the games arcade. Port Orleans French Quarter (then just simply "Disney's Port Orleans Resort") first opened its doors on 17 May 1991, so today the resort turns Twenty One. Thanks for 21 years of magical vacation memories!